Hello, friends! Thank you for visiting "Ohana & Soichiro". This website is created by two Japanese tourist, Naoko(wife) & Ryuichi(husband). 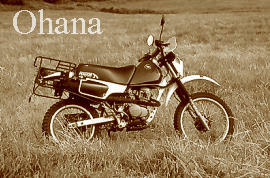 Here, we're reporting our motorcycle travel throughout African countries since Oct.2002. So, what does "Ohana & Soichiro" mean? They're the names for our motorcycles! Because we're using two same types of motorcycle (HONDA XLR80), we needed the names for distinction. "Ohana", meaning "flower", belongs to Ryuichi, and "Soichiro", whose name was taken after "Mr.Soichiro Honda", belongs to Naoko. 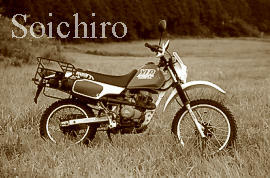 Unfortunately, XLR80 is old motorcycle manufactured in 1980, and it's already difficult to find the same model even in Japan. Therefore we cherish these two precious motorcycles. We believe (hope?) their 4-stroke engines are tough enough for crossing the African countries. September 2002, we've sent them to the port of Barcelona (Spain), using ship container. Well, we have to see what happens.... but since we don't want any breakdowns of these lovely bikes, we'll just gonna go very slowly, and carefully. If you want to know more about Naoko & Ryuichi, you'll find brief notes at Shortie's Websites (written in English and Japanese). For more informations about the enhancements to our machines, you'll find them at Modifies to XLR80 but I'm afraid it's all written in Japanese (Sorry! ).Actually, we did nothing extraordinary. We just changed the colorings and added big strong carrier. Anyway, we hope that this website can be the one of the connections between Japan and African countries, as well as all the dear friends we've met during the trip!